You might notice that the color scheme used in the design of Glisten Dental is green. This reflects not only our warm and welcoming atmosphere, but also our dedication to practicing in an environmentally friendly way. Practicing mercury-free dentistry means approaching restorative care without the use of amalgam fillings. These long-used dental restorations are fabricated from mercury, tin, silver, zinc, and copper. Research has shown mercury as the second most toxic substance on earth, of which there are no safe levels of exposure. Dr. Angie restores teeth using composite and other dental materials that do not contain mercury, and is trained in the safe removal of existing amalgam fillings. Using precise technique and a specifically designed pump/evacuation filtration system, Dr. Angie ensures the safety of the patient, her team, and our local water supply. For more information on the removal of amalgam fillings and their alternatives, contact us at (918) 528-7536. Although current research shows that sealants and composite restorations containing BPA are safe, our office provides BPA-free materials to those who prefer this option. Using a digital x-ray system is safe, comfortable, and effective, eliminating the need to bite down on uncomfortable film, cutting down on radiation exposure, and saving the environment from harmful chemicals needed to process standard film. Over time, our water system is saved from approximately 200 liters of toxic developing substance by using digital rather than traditional x-rays. Computers are an advancement of which we take full advantage. With computerization, we are able to reduce the amount of paper used in our office - an estimated 50,000 sheets a year! Our patients benefit from our paperless billing and digital communication by phone, text, internet, and email. Utilizing steam sterilization for our equipment eliminates the need to dispose of harmful chemicals into the environment. 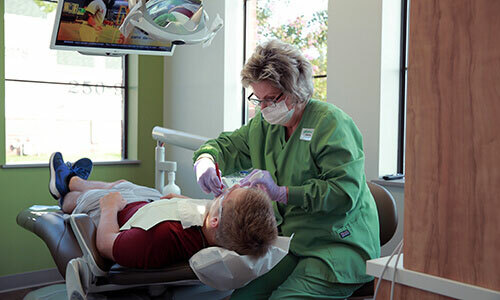 Operating as a latex free office, Glisten Dental uses nitrile gloves, rubber dams, and nitrous oxide masks, eliminating the risk of allergic reactions that can occur with latex. We further promote a healthy environment and minimize both water and paper waste with alcohol hand rubs in patient rooms. Not only does alcohol hand rub effectively reduce the number of bacteria better than soap and water, this practice means that we save 360 paper towels and 90 gallons of water each day! Our patients are encouraged to decrease the spread of germs by taking advantage of the alcohol hand rub upon entering and exiting our practice. Rather than use disposable sterilization bags, our treatment rooms are equipped with dental cassettes, which hold instruments throughout the sterilization process. This system not only ensures that instruments remain sterilized until used, but it also saves approximately 40 disposable sterilization bags each day. Want to learn more about what an eco-friendly dental office means to us? Contact our Tulsa office to find out more!